Shirts With Random Triangles: South Carolina QB Lorenzo Nuñez Out For Rest Of Spring Practice With Knee Injury. South Carolina QB Lorenzo Nuñez Out For Rest Of Spring Practice With Knee Injury. Lorenzo Nunez. Image via testate.com. Some not-so good news out of South Carolina. Gamecocks quarterback Lorenzo Nu ñez has been shut down for the rest of spring practice after suffering a knee injury on Saturday. 247Sports' Josh Whittle reports that Nuñez suffered a hyper-extended knee along with a sprained ligament during practice on Saturday. He'll miss the remainder of spring practice along with South Carolina's Garnet & Black Spring Game on April 9. 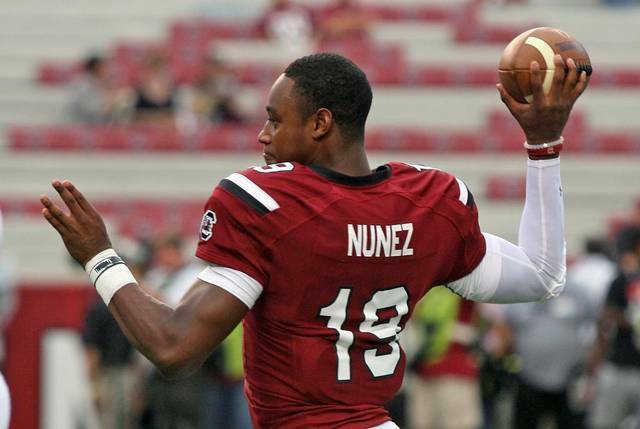 The injury could be a setback to Nuñez's hopes to win the Gamecocks' starting QB job for the upcoming season. It's looking like a five-way battle between Nuñez and fellow Gamecock QB's, Brandon McIlwain, Connor Mitch, Perry Orth, and Michael Scarnecchia. Nuñez appeared in eight games for South Carolina in the 2015 season. He went 32 of 52 for 376 yds. with three touchdowns.